Nutty cherry biscotti treats are a welcome gift any time—but even more so when they're cut into heart shapes and drizzled with melted white chocolate! Mix flour and baking powder. Beat butter and sugar in large bowl with mixer until light and fluffy. Blend in eggs and vanilla. Gradually add flour mixture, beating after each addition until well blended. Stir in cherries, nuts and 1-1/2 cups chocolate. Roll out dough to 1/4-inch thickness on floured surface. 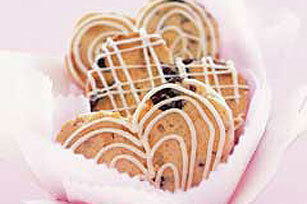 Cut into heart shapes with 3-inch cookie cutter, rerolling dough scraps. Place cutouts, 2 inches apart, on baking sheets sprayed with cooking spray. Bake 10 to 12 min. or until lightly browned; turn. Bake 10 to 12 min. or until slightly dry and golden brown. Remove to wire racks; cool completely. Melt remaining chocolate as directed on package; drizzle over cookies. Let stand until chocolate is firm. Plan a break in your busy holiday schedule to sit down and enjoy a serving of biscotti along with a hot cup of freshly brewed MAXWELL HOUSE Coffee. Store in tightly covered container at room temperature up to 2 weeks.